In a field crowded with first-class competitors, Dodge hopes its Journey SUV for 2013 can lure buyers with an unbeatable combination of impressive features, versatile seating configurations and a low price. To this end, the Journey stands alone as the only mid-size crossover to offer a choice of 4- or 6-cylinder engines, front- or all-wheel drive and 5- or 7-passenger seating. You cannot lock your key in your vehicle. I love that my vehicle has 3rd row seating. It can seat up to 7 people. It is very spacious, and pretty comfortable. There are drink holders even for the 3rd row seating. There is a lot of built in storage. The passenger seat has a storage place in it, and the floorboards in the backseat has storage in them. It has built in Bluetooth for hands free calling, and to play your music. It shows you how fast you are going on the screen right behind your steering wheel. You can also switch from showing your speed to seeing how much air your tires have, or seeing how many miles you have until you need gas. It pops a message up when it is time to change your oil, and it pops up a thing if your out of windshield wiper fluid. All windows are power operated. Plus your side mirrors are power operated. The driver's seat is power operated, but the passenger seat you have to pull the lever under the seat. I love that I cannot lock my keys in the car. It is push start, and if you get out and try to lock your car with the button it will not let you. It will lock then unlock and honk at you if the key is detected in the vehicle. I have had a couple of recalls on my vehicle for the ignition switch and the breaks could possibly lock up, but I haven't had any problems so far. It is kind of hard to see sometimes. The side mirrors will sometimes block your view so you have to triple check when pulling out. It has been a really good and reliable vehicle so far. Which I need since I have 2 kids. It has great performance and it is reliable. 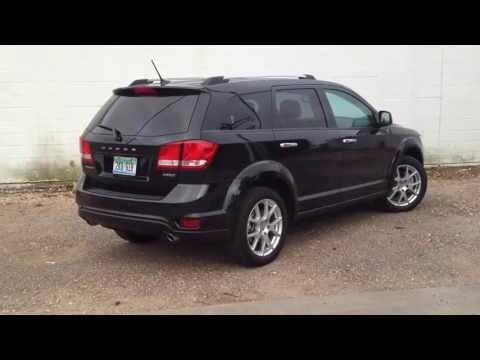 Dodge Journey is a cross being a car and SUV. Overall it is a great car to travel with family and friends. I bought this car brand new from the lot. The performance is great, haven't had any engine problems, it is very reliable and excellent on gas. Based on it is size, you would think it will cost you a lot of money on gas. But it does not. Some of the features that I love is Bluetooth capability, climate control for all riders, plenty of storage space, multiple charging ports for many handheld devices. Also the seats are nice, comfortable and easy to adjust. I love the fact, that you are able to raise your seat up to view the road better. What I do not like is the small dashboard display for radio. I think Dodge should have included a larger display screen for this model. I really like this model and I would recommend this model to someone who likes the feel of a car, but has the space and feel of a large SUV. I've had this car for about 5 years now, and it isn't bad at all, but it's not completely fantastic, either, it's somewhere in the middle. I like that the windows are automatic, and that the car can detect my keys from 3 feet away and unlock automatically if I need it to. I also like how I can control the speakers. The seats are really comfortable and don't overheat in the summer, which is a blessing especially because I live in a very hot climate. However, the air conditioning can take a very long time to start working, and I've heard this is a common problem with Dodge vehicles in general. There is also a feature where you can control whether you want the back windows to go down or not, and I'm guessing it was supposed to be a parental control, but it's really more of an inconvenience than anything else. This would maybe be a good first-car purchase, but not necessarily the best upgrade.